I’ve written on this before, but even though UW doesn’t have a lot of seniors the ones who have played have been a huge part to their success this season. 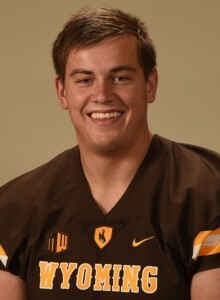 Along with Wacha, where do you think UW would have been without center Chase Roullier, wide receivers Tanner Gentry and Jake Maulhardt, tight end Jacob Hollister, nose tackle Chase Appleby, outside linebacker D.J. May, punter Ethan Wood and long snapper Brendan Turelli? I will say it — the Cowboys wouldn’t have won eight games and a divisional title in the Mountain West. Sure would be nice if Appleby and May could play tonight, but as most of you know, both were lost to season-ending injuries during the regular season. “When you have seniors that play really well, don’t get senior-itis and have their best years, that usually translates into really good years for your team,” Bohl said. — On paper, it doesn’t look good for UW to run the ball against BYU. The Cougars allow just 108.4 rushing yards per game, and were the nation’s No. 1 rushing defense over the month of November. UW will try and run the ball, but don’t be surprised if it passes a little more to possibly loosen up that BYU defense. With Gentry at 6-foot-2, Maulhardt at 6-6 and Hollister at 6-4, there could be a good matchup with BYU’s cornerbacks where both starters are freshmen. Something to watch for. — “Mangum can run it, but I doubt that will be a major focus. He facilitates ball well, and has a strong enough arm to make every throw they want. Will there be as much read-zone with him? 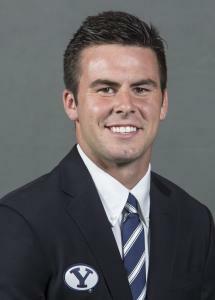 We’ll find out.” — UW defensive coordinator Steve Stanard on BYU sophomore quarterback Tanner Mangum, who replaces injured senior Taysom Hill in the bowl game. — UW and BYU were in the same conference from 1922-2010. They were both members of the Rocky Mountain Athletic Conference, Skyline Conference, Western Athletic Conference and Mountain West. — The Cowboys need to score 29 points to tie a single-season school record for points. UW enters the bowl game with 482 points. The 1988 team scored 511 points. That 1988 team was the last UW squad to play in a bowl game in San Diego. Let’s hope tonight’s game has a better outcome as the Cowboys lost the 1988 Holiday Bowl to Oklahoma State 62-14. — “He’s such a play-maker. He’s got ice in hisi veins, and can complete a pass when he needs to. He always comes into the huddle confident, and that makes everyone around him confident.” — UW senior tight end Jacob Hollister on redshirt sophomore quarterback Josh Allen. — Allen’s approaching some UW single-season records. He’s tied for third in touchdowns responsible for with 33. He needs two to tie for second and four to tie for first. Allen needs two touchdown passes to move from fourth to second, and enters the game with 26. 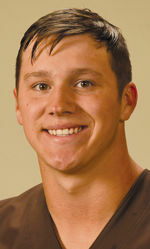 He also could move into the top five for passing yards, and he currently has 2,996. His 3,481 yards of total offense is third most in a season. He would need 467 against BYU to tie for second. — “I wouldn’t say the sting is over, it’s just less there. Now we have to focus on winning the bowl game. We will remember that loss until we get back to the next championship game. It will push us harder in the offeseasnn, and definitely in this bowl game to end our season on a postive note.” — UW sophomore nose tackle Sidney Malauulu. — Junior running back Brian Hill’s next touchdown run will give him 35 for his career, and put him along in the UW record books. He’s currently tied with Eddie Talboom (1948-50). Hill has 20 100-yard games over his last 29 contests, including nine this season. During Tuesday’s news conference with both coaches, Bohl said that himself, Hill and his mother, Tamera Lewis, will sit down and make a decision on whether Hill comes back for his senior season — something Hill said last week. — The Cowboys look to snap a seven-game losing streak versus BYU. During that skid they’ve scored only 20 or more points twice, and they’ve allowed 30 or more points five times. — The Cowboys also hope to end a two-game bowl losing streak in San Diego, having lost the 1987-88 Holiday Bowls here. The last time UW won a game in San Diego was on Oct. 29, 2011 when they rallied to beat San Diego State 30-27. Including the two bowl games, UW is 7-13 all-time in games played in San Diego. For more coverage from the game, see Thursday’s Wyoming Tribune Eagle and Laramie Boomerang and log on to wyosports.net. This entry was posted in Football and tagged Brendan Turelli, Brian Hill, BYU Cougars, Chase Appleby, Chase Roullier, Craig Bohl, D.J. 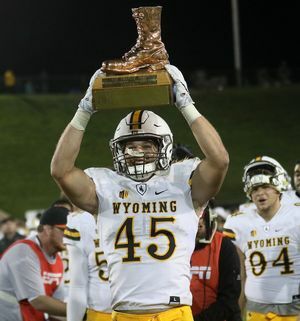 May, Ethan Wood, Jacob Hollister, Jake Maulhardt, Josh Allen, Lucas Wacha, Poinsettia Bowl, Tanner Gentry, Tanner Mangum, Wyoming Cowboys, Wyoming Football by Robert Gagliardi. Bookmark the permalink. I had a baseball coach that used to say, bonehead plays. Well, we lost because we made a bunch of bonehead plays. Good season though. Thanks for the momories.